Last week, scientists at The Laser Interferometer Gravitational-Wave Observatory, or LIGO, announced that they had confirmed Einstein’s century-old theoretical prediction of “gravitational waves,” a feature of his theory of general relativity. 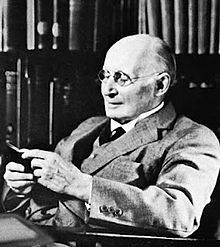 As we go with the flow, we might send carefully-calculated birthday greetings to Einstein’s rough contemporary Alfred North Whitehead; he was born on this date in 1861. Whitehead began his career as a mathematician and logician, perhaps most famously co-authoring (with his former student, Bertrand Russell), the three-volume Principia Mathematica (1910–13), one of the twentieth century’s most important works in mathematical logic.